“SUM-96” was founded in December 1969. The field of activity from the basis time is the structure of the piles foundation works. 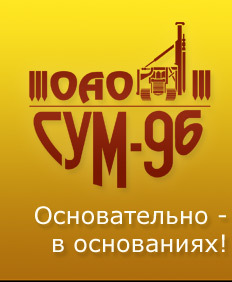 Today public corporation "SUM-96" is the leading enterprise in this sphere market of Belarus. On the construction “SUM-96” was instructed for the pile bases of such major objects, as «Gomselmash», Polotsk factory of fiber glass, Minsk Automobile Plant, Vitebsk television factory, Mozyrs oil refinary , and the complex of sports constructions «Minsk - Arena», residential areas in Minsk, Brest, Vitebsk, Mogilyov and hundreds of other objects of civil and industrial construction. - pilepress driver SVO-750-16-1-0-01 with the bearing plate, pressing effort under 90 tons. More than 100 units of tractors, the dieselgenerators, pump stations, pneumocompressors, welding assembly units, and the other special machinery which allow us to do the work with the minimum expenses in various conditions. There is a big heavy trucks and truck cranes park. It allows us transport pile-driving machinery throughout Belarus territory, to provide the projects with piles and the other building materials necessary for the construction. The basis for reliability and profitability of the piles foundation is a correct definition of bearing ability of piles. For this purpose there is the special department at the enterprise dealing with the piles testing and carries engineering-geological researches out. It also carries out the engineering and geological research/ We know precisely, what is necessary for our customers and we do our best to build any projects in time.